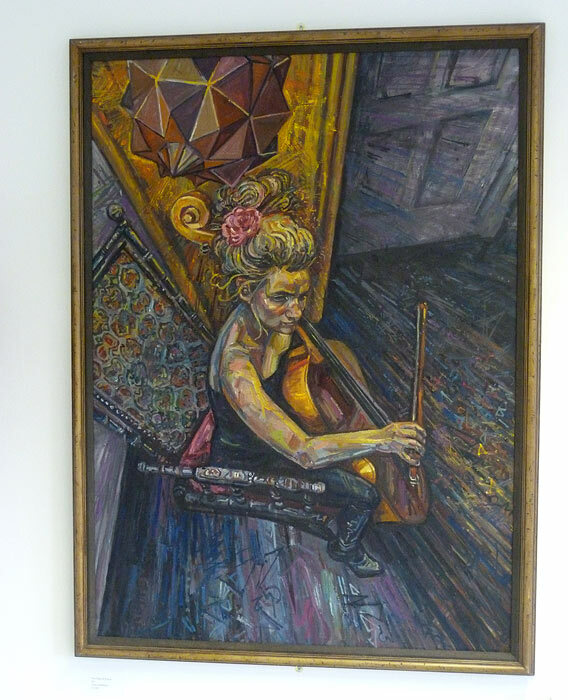 I have been a friend of Carole Racionzer for some time now and several years ago she also bought my 2012 portrait of my cousin Anna Rendall playing the cello. The first painting of mine that Carole bought; a portrait of my cousin playing the cello. I was delighted to learn that she was getting married to Stan in 2017, and when she asked if I could paint a picture as her main wedding present I was happy to help. The idea was that instead of her guests buying wine glasses or kitchen paraphernalia as presents, as a unique and personal alternative they could all chip in for a custom painting. I have long thought that many wedding photographs end up being quite formal, posed and lacking in soul. 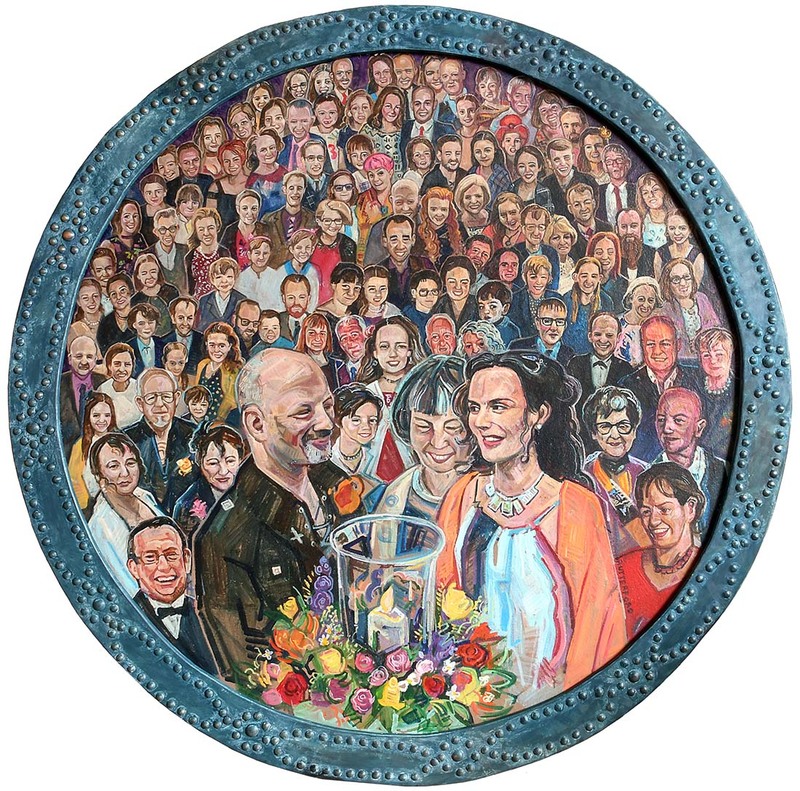 A party painting like the ones I am known for could provide a lasting memento of the day and it would also reflect the life and joy of their wedding celebration. Stan and Carole on their wedding day. This scene formed the initial focus of the painting. Chris and Carole at the beginning of the reception, as the painting starts to take shape. 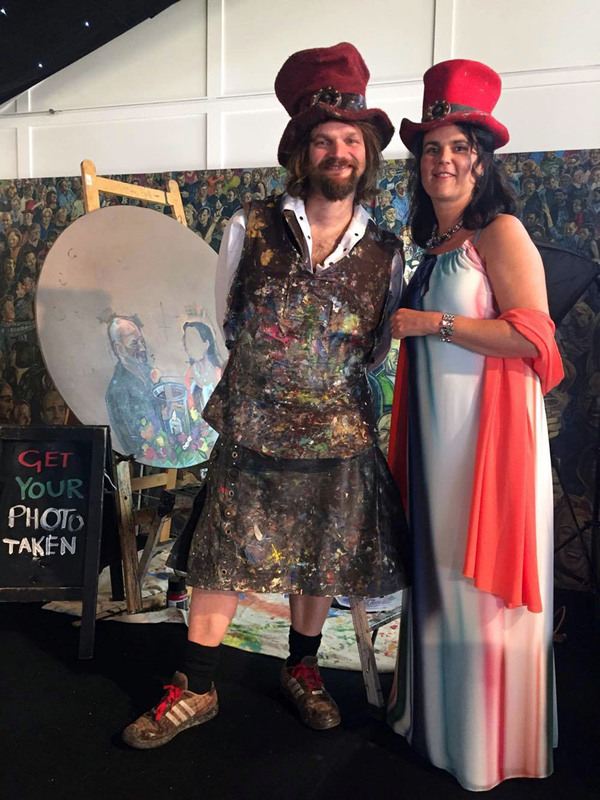 Chris’s Hogmanay mural helped create a party ambience in the background, and also helped guests understand what the painting would eventually become. I decided to paint portraits of all the wedding guests as well as the main wedding party. 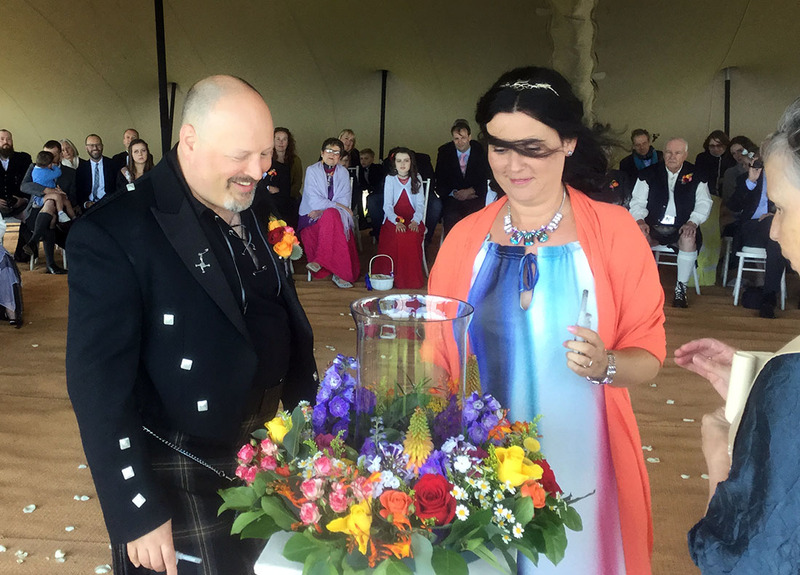 Carole and Stan hosted their ceremony at Archerfield House in East Lothian, with a handfasting ceremony led by a Humanist minister and their guests arranged around them. 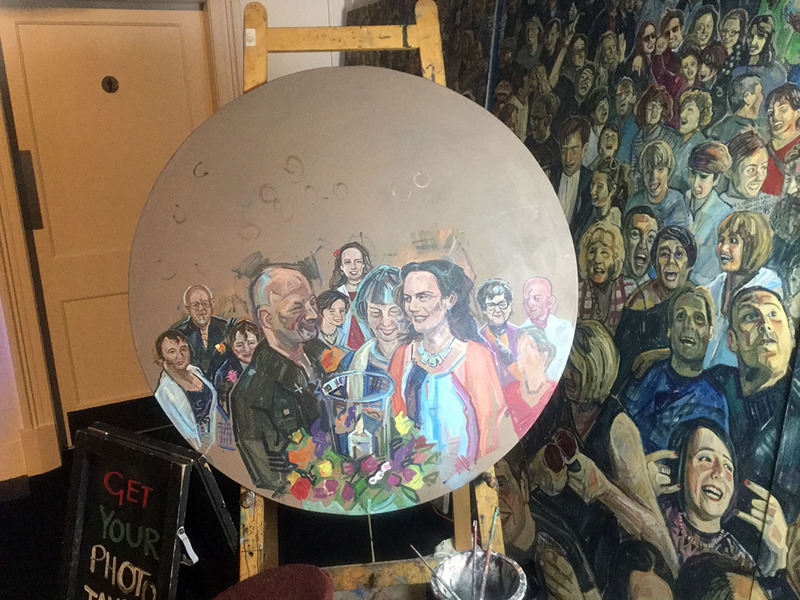 It was decided that I would make a picture of that scene and build it on a circular canvas that reflected the shape of the ceremony. 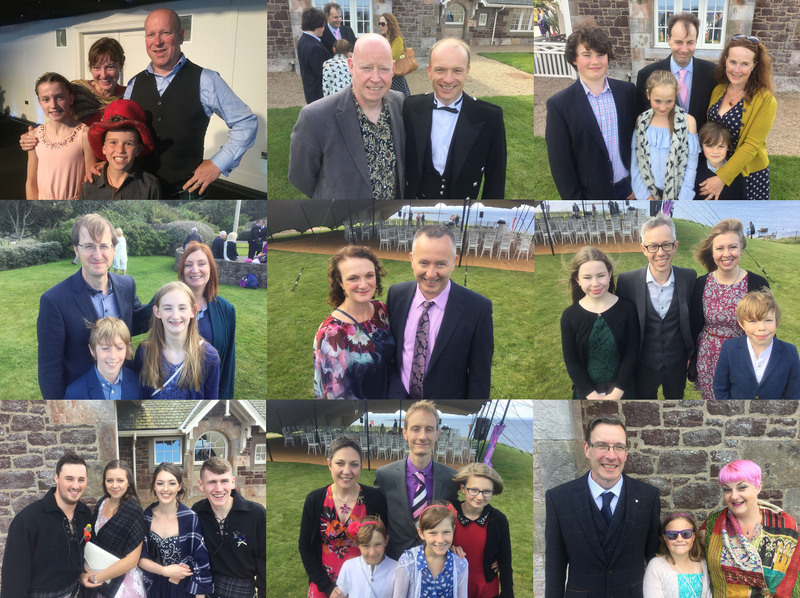 I gathered reference photos of the happy couple during the ceremony and then took pictures of as many wedding guests as I could get to pose at the time. I then went down to the reception venue and started the painting in full view of the guests. Throughout the day this painting process provided unique on-site entertainment for the wedding guests; I painted the main wedding party first, starting with the bride and groom before painting Carole’s daughters, the best man, the matron of honour, and the parents of the happy couple. People of all ages are fascinated by the process and the openness of how I do it, and wedding guests were constantly hovering around the easel, watching my progress. Chris took dozens of photographs of the wedding guests, to be painted into the artwork either during the reception or after the event. The painting underway during the reception. Guests were encouraged to stop by to get their photo taken and to watch the progress. To add to the ambience of my workspace, I brought four large boards of crowd scenes from my 2013 Hogmanay painting. This gave the guests an idea of the direction in which the wedding painting was going. Chris adding portraits to the painting in his studio in Leith, using photo reference collected during the wedding reception. 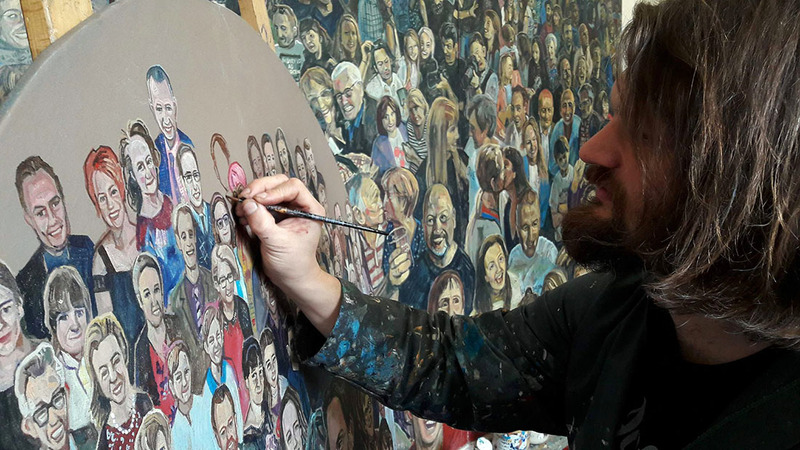 After the event the picture was taken back to the studio in Leith and the longer process of painting all the guests in began. Once finished it was popped in a custom-made frame to be presented to Carole and Stan and hung in their Perth home. Job done!